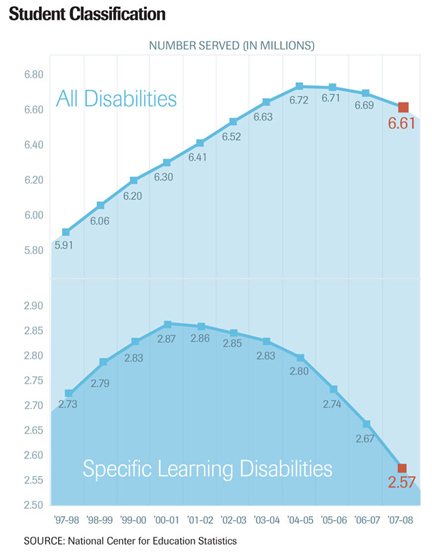 After decades of what seemed to be an inexorable upward path, the number of students classified as learning-disabled declined from year to year over much of the past decade—a change in direction that is spurring debates among experts about the reasons why. 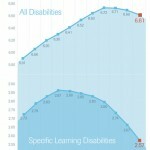 The percentage of 3- to 21-year-old students nationwide classified as having a “specific learning disability” dropped steadily from 6.1 percent in the 2000-01 school year to 5.2 percent in 2007-08, according to the most recent data available, which come from the U.S Department of Education’s 2009 Digest of Education Statistics. In numbers, that’s a drop from about 2.9 million to 2.6 million students. 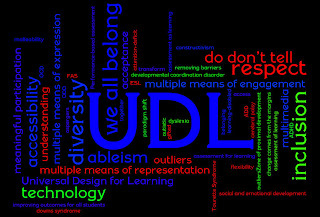 To Read More Go to Edweek.org website.